Take your guitar teaching to a new level! Hal Leonard's top-selling comprehensive method for band and strings is now also available for guitar. Take your guitar teaching to a new level! Hal Leonard's top-selling comprehensive method for band and strings is now also available for guitar. 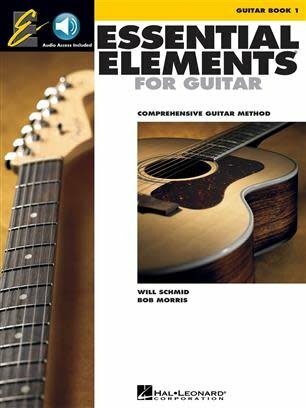 With the time-tested classroom teaching methods of Will Schmid and Bob Morris, popular songs in a variety of styles, and quality demonstration and backing tracks on the accompanying audio that is available for download or streaming online, Essential Elements for Guitar is sure to become a staple of guitar teachers' instruction – and get beginning guitar students off to a great start. This method has been designed to meet the National Standards for Music Education, with features such as cross-curricular activities, quizzes, multicultural songs, basic improvisation and more. Concepts covered in Book 1 include: getting started; basic music theory; guitar chords; notes on each string; music history; ensemble playing; performance spotlights; and much more! Songs used in Book 1 include such hits as: Dust in the Wind • Eleanor Rigby • Every Breath You Take • Hey Jude • Hound Dog • Let It Be • Ode to Joy • Rock Around the Clock • Stand By Me • Surfin' USA • Sweet Home Chicago • This Land Is Your Land • You Really Got Me • and more!